How to give bandwidth priority to application over another? I'm connected to the internet via wireless modem. My PC is connected to the modem via Ethernet and the modem connects me witlessly to the nearest Base Station. The modem has no interface or options to modify. I play WoW and use Ventrillo ( Voice Chat ). Is there a way to give WoW more priority than Ventrillo ? Because sometimes i have over 600ms latency. Bandwidth is 512Kbps Up and 128Kbps Down. Usually we favor one system over another on the same lan, not one application vs another. I've only played with the free version of Netlimiter to see it report net traffic per process but their product page says it can limit by app. Live shot from NL2Pro. I need to update some time. I'm Limiting ShareEX to 25KB/s because I don't feel like sharing at the moment lol, but theoretically you could do that for vent if you wanted too. I agree that you should lower the quality in vent if you can, since limiting the bandwidth could cause more problems than solve since transmission/receiving require X amount of bandwidth. It allows me to limit incoming and outgoing bandwidth for any program/process that is started, by default showing active programs. You can also set up rules and filters to do various things with the software, and has a large number of statistics options, so it's quite a powerful peice of software, especially if an IT administrator decided to make use of it's remote management capability, but I do not have any experience with remote management with this software. Something like that but for linux would have been very helpful to me a few weeks ago.. Cool program. I remember reading your Linux thread a few weeks back but I only knew about Netlimiter for Windows (plus i haven't really done much using Linux) so didn't reply. Grants’ is a brand-new feature in NetLimiter 2. It could seem similar to ‘limits’, but it works differently. When you set grant for application or connection, then it means that you ‘grant’ specified bandwidth for it. If other application/connections take too much bandwidth, then it is taken from them and is given to application/connection with granted bandwidth. You must set bandwidth speeds in Network Manager in order to use the grants. In other words, if you hit your cap throughput, the program will take away bandwidth from "less essential" processes and redistribute it to programs that have grants. Thanx all for the replaies. Since i'm not the admin of the Vent server, and since all ppl have 4Mbps+ connection, they won't lower the quality of vent. I'll try this software, seems nice. The control would need to be inside the router or access point to do that. How to permanently set Priority to a program? How to limit wireless bandwidth? 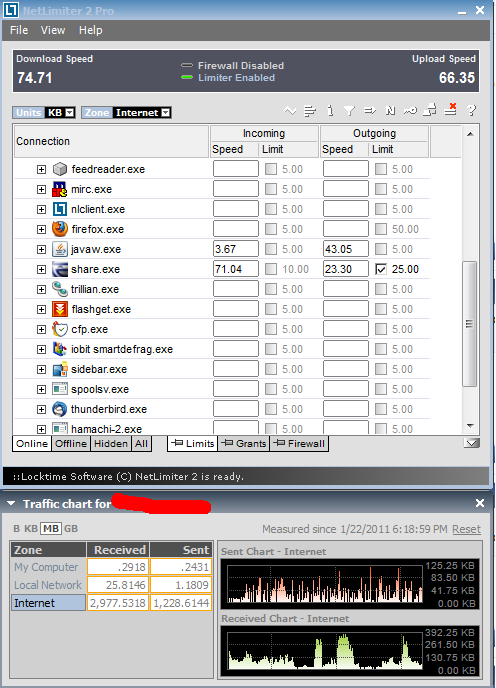 How to check for programs consuming to much bandwidth.